Now in its eighth year, this series is taking a look at the current group of students, finding out how they are getting on and what they are making of their experiences in the heart of the Northern Ireland Assembly. 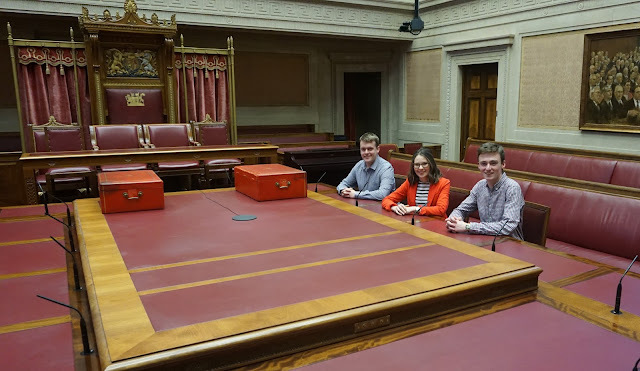 Having already learned how Ross Graham is finding life in the Bill Office, we now catch up with the students working in the Committees – Zoe Rogers, Brendan Corr and Daniel Lowe. Law student Zoe developed a keen interest in social justice and human rights law during her studies. During internships with faith-based charities, CARE and Evangelical Alliance in Northern Ireland, Zoe also gained an interest in the process of law-making, the role of civic engagement and the impact of public policy on wider society. With these interests, the LSP Programme provided a perfect opportunity to further develop Zoe’s skills, gaining first-hand experience of a working legislature combined with further study and a chance to undertake original research. Having studied History and Politics at Queen’s, Brendan has always had an enthusiasm for all things political. Through his studies and an internship at political lobbying company Stratagem, Brendan also gained a first-hand perspective of political matters and an interest in how policies and legislation are actually developed. After learning about the LSP Programme from a friend, a little further research told him that this was a course he’d love to do. Daniel has studied Theology in Queens and Business at Maryville College, Tennessee through the British Council’s Study USA programme, eventually graduating with a QUB Certificate in American Business Practice. After learning about the LSP Programme, Daniel recognised the opportunity to gain first-hand experience of the political process and to be in such close proximity to the people and the procedures behind law-making.